What’s my Beef with Protein? THIS ISSUE’S TESTIMONIAL: She is 84 and the trembling in her voice went away! THE MARTIAL ART OF WELLNESS: What’s my Beef with Protein? Back in the 80’s, when I first became vegetarian and told people about it, often the first question out of their mouths was, ‘Oh, where do you get your protein?’ Then I would proceed to lecture them: that proper combination of certain foods would make up the entire set of amino acids required for human need of protein; reminding them that there were hundreds of millions of people in India and China that lived long life as vegetarians with no cancer; I would tell them how healthy I was; and I would argue that “we do not have the physiology of carnivores with their meat-tearing teeth, short digestive tract, and powerful digestive juices; that rather we have the physiology of the ape, teeth designed for chewing, pre-digestive enzymes in the mouth, partial digestion at the stomach and a long digestive process in our 30 feet of intestines.” At the time, I believed my arguments were convincing, but in retrospect, I think I probably just bored them to sleep. Gorillas have nearly the same DNA as human beings, which means that our body chemistry and theirs is almost exactly alike. Gorillas also have almost the same digestive system that we have. 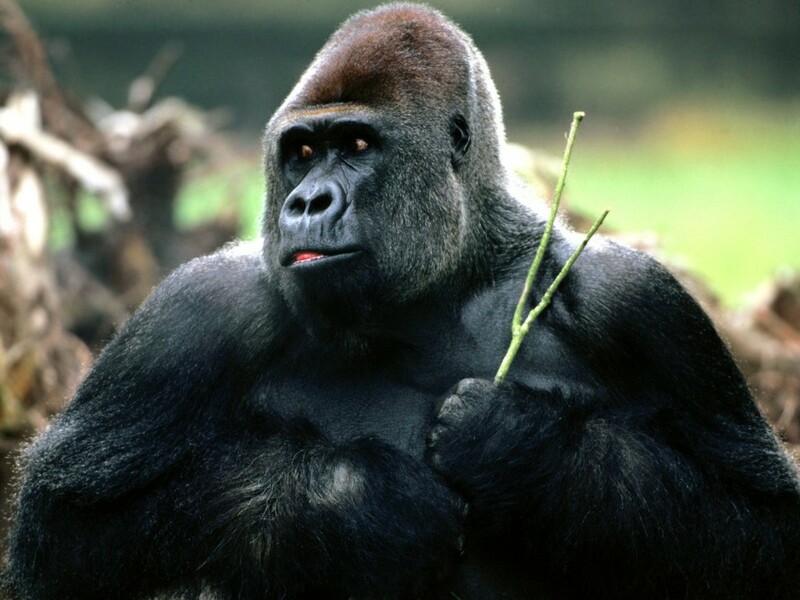 So how can gorillas grow up to be so big and strong without eating meat, dairy products, eggs, or fish (other than a few termites)? Interestingly over those long years without meat, I have been in perfect health. I actually feel better now without meat, I digest and eliminate better, and I sleep much better. I maintain or/and have actually gained weight at times. All aspects of my metabolic and energetic body life are just better. I had several annual doctor visits over those decades and all turned out perfect; no issues with blood pressure or high cholesterol, no vitamin D deficiency, no dis-ease diagnosis. In short, I got a clean bill of health. The only issues were some of the minor social discomforts having to explain myself… but even those were my doing as I did not know the proper neutralizing answers. Over the years since, I’ve remained mostly vegetarian, eating little meat and dairy on and off until last October when at the Integrative Cancer Society conference in Houston. There, after hearing cancer stories, meeting many cancer victims and feeling the pain, I just stopped eating meat, fish or dairy altogether. Just like that – it just happened. It seems like I have finally made peace with my addictions/attractions; I now eat mostly plants, fruits, grains, beans, nuts, seeds, some bread and pasta, and other non-meats. Is plant protein complete and/or as good as animal protein? Is it necessary to combine plant foods in a meal to get complete proteins? How much protein should one consume? Is it advisable to take protein powder for people who do vigorous exercise or sports? Are some sources of protein of higher quality? Does a vegetarian diet have enough protein, and is it healthy? Should one take protein supplement to build muscle? Is protein from meat, fish, milk and eggs superior to protein from plants? Is meat the best protein source with other foods having little or no protein? The myth that we should eat more protein dates back to the beginning of the last century. The majority’s view back then was that health – and especially fitness – depended on eating generous amounts of protein, particularly meat (Millward, 2004). It was even reckoned that animal protein was the solution to wiping out child malnutrition in the third world (Autret, 1963; Gounelle de Pontanel, 1972; Stillings, 1973; Scrimshaw and Young, 1976). The myth reached epic heights in the 1960s. A UN report was published which identified worldwide protein deficiency. It called for a ‘global strategy to avert the impending protein crisis’. International aid began to focus on projects to address the so-called protein gap. The US government, for example, subsidised the production of dried milk powder to provide high-quality protein for the world’s poor (Campbell and Campbell, 2005). But not everyone accepted that protein was the most important nutrient of all. Wartime studies in the UK by Widdowson and McCance found that orphanage children grew faster than the general population when they ate a bread-based diet, with only a small fraction (14 per cent) of their protein coming from milk products. And the orphanage children grew no faster when nearly half of their protein was from milk! Bread provided the children with plenty of energy to support their growth, whilst meeting more than double their protein needs (Millward, 2004). In truth, the protein gap disappeared ‘at the stroke of a pen’ in 1969 when researchers concluded that almost all staple foods contain enough protein for our needs. Currently the traditional doctrine is less rigid and concedes that intake of protein mixes may be spread over several days. It is therefore unnecessary to ensure an optimum combination at each meal. This new concept has been slow to catch on even though the American Dietetic Association already supported this in 1988. Now we know without a doubt that by eating non processed whole foods in a varied way and in sufficient quantities, it is almost impossible to lack any kind of amino acid. . This myth is so pervasive that nutritionists with superficial, purely theoretical knowledge of the vegetarian diet still propagate it. This is why numerous books contain lists of supplemental vegetable protein mixes for vegetarians to use to effectively replace animal proteins. This notion is even more deeply rooted than the myth that spinach is rich in iron. Books abound with lists of the different proteins’ biological values. Moreover, eggs are always found at the top of these lists, followed by other animal-based food products. What is the origin of this list? Two scientists, Osborne and Mendel, conducted nutrition experiments on rats in 1914. On this occasion, they found that egg proteins caused rats to gain weight most quickly, followed by other animal proteins. They overstated this result, as was customary back then. This is why egg protein ended up being considered as the best. Although the findings of such an experiment obviously had no repercussions on the benefits of proteins on rats (and even less for humans), they constituted the basis of all the future protein equivalent tables. 1. Being overweight is no longer an enviable and healthy goal. 2. Human are not “metabolically efficient” carnivores (like a feline, for example), we lack an effective mechanism for removing large amounts of excess proteins. 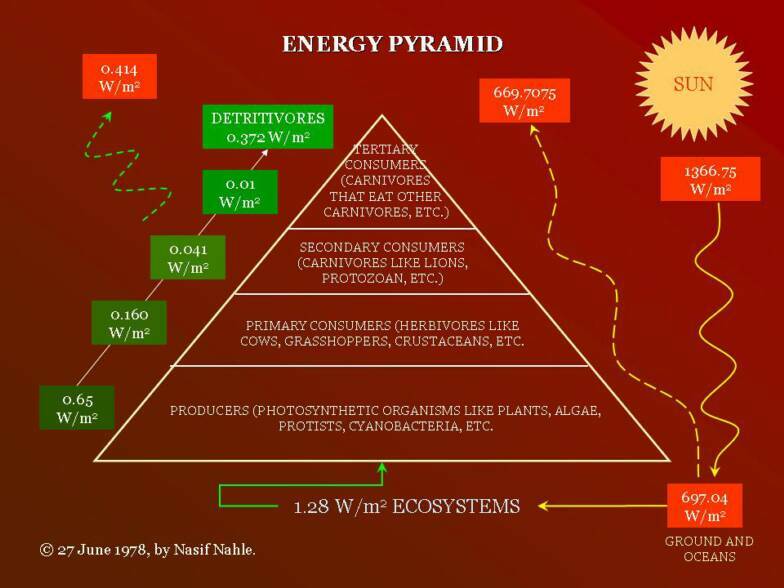 Note at the botton of the pyramid, single out are algae and specifically mentioned is cyanobacteria (all blue-green algae) as best producer of energy. Cyanobacteria is known to deliver 100% of its energy to the first consumer…. 100%. Then you understand why the BAC are so efficient. We currently pay little attention to this lack of disposal, despite the adverse consequences. Already in 1948, Professor Lothar Wendt had addressed this particular problem. However, he was unable to convince others when facing the prevailing “false” concept at the time which espoused that the human body burned all surplus protein, as it is unable to store them. Since the general public has heard of mad cow disease and Creutzfeldt-Jakob disease, we know that protein deposits can be found in the body: proof of this is the discovery of prions (proteins) in the brains of affected cattle. Proteins perform many functions and are essential for the body. In fact, enzymes are proteins! Getting enough protein was therefore a major concern. No attention was paid to getting too much protein, since it did not represent as big a problem in the post-war era. It was therefore natural that the focus was to consume the greatest possible amount of protein. Many scientists and nutritionists unfortunately continue to adhere to this notion leading to an over-consumption of protein. The biological value of a protein is expressed as a percent. It is defined as the proportion of 100g of protein ingested that is retained by the organism. For example, eggs have a biological value of 94%, meaning that the body retains 94g of protein from 100g of chicken egg protein ingested. Did you know that eating a typical meal of meat no longer fits the definition of eating a whole food? Even meat eating animals know better; they will eat the whole animal; the pancreas, the liver, muscle and fat, ligaments, the eyes, brain tissue, small bones, and bone marrow, etc., and thus eat a more balance meal. 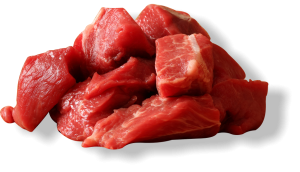 Standard meat portions are typically overdose of proteins leading to inability to eliminate the residue efficiently. Problems due to excess protein are increasing. One of the best-known examples is osteoporosis. In countries where products rich in animal proteins (meat, milk and eggs) are widely consumed, this disease is a real problem. Despite this, we continue to recommend the consumption of dairy products to prevent osteoporosis. A number of studies confirm unequivocally that excess protein in the body promotes osteoporosis, as the organism must then take calcium from the bones to prevent over-acidification of the body. The kidney’s ability to eliminate excess dietary protein is very limited, thus there is a constant excess of protein in the body. Kidney failure appears much more frequently from significant protein consumption than from moderate consumption. What are the protein requirements for human beings? During almost every decade of the last century this question has had a different answer. In light of current data, however, we get very different answers depending upon the institute to which we refer. We must remember one thing from this ever-changing data – recommendations for protein intake have drastically reduced over the past few decades. Currently approximately 0.8g of protein per kilo of body weight per day is recommended. Regarding the protein content of a given food, it is interesting to note that breast milk contains only 1.2% protein. Despite this, the infant is optimally supplied during its most important growth phase. By comparison, the protein content in legumes ranges from 10%-15%. In all practicality, nobody really has to worry about the amount of protein consumed daily. Most varied vegetable diets contain sufficient quantities of all of the essential amino acids without the risk of overloading it. The name is of Greek origin, ‘proteios’, which means ‘of prime importance’. 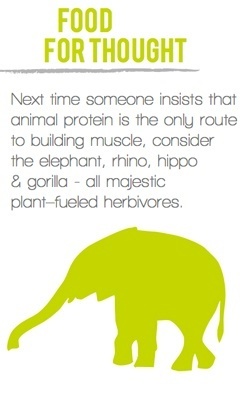 Each protein is a mosaic of about 100 to 500 elements, called the amino acids (some proteins may contain thousands). Amino acids are organic compounds that form proteins by being linked together. Currently there are more than 80 known natural amino acids. There are 20 amino acids found in the human body. Eight (8) of those are considered essential and must be obtained from food, as the body cannot synthesize them. Functional units of muscle tissue and enzymes are also considered proteins. Human cells are made up of mostly proteins. Each animal species and each vegetable species contain specific protein substances. When human beings consume a protein of a different nature, the body breaks down the amino acids during digestion and then synthesizes a protein that is compatible. 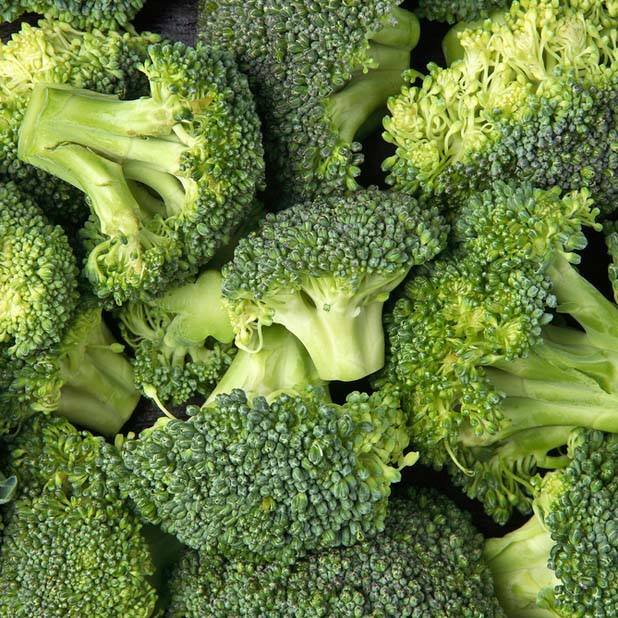 Did you know that there are nearly as many protein support amino acids in broccoli as there are in meat? The average (SAD) Standard American diet contains too much meat and dairy products. As a result, it is often too high in protein. This can lead to a number of serious health problems. Although fat is the dietary substance most often singled out for increasing cancer risk, protein also plays a role. Populations who eat meat regularly are at increased risk for colon cancer, and researchers believe that the fat, protein, natural carcinogens, and absence of fiber in meat all play roles. The 1997 report of the World Cancer Research Fund and American Institute for Cancer Research, Food, Nutrition, and the Prevention of Cancer, noted that meaty, high-protein diets were linked with some types of cancer. America has the highest obesity level in the world. According to the CDC (Center for Disease Control and Prevention), approximately 72% of adults in the U.S. are at least overweight; 32% overweight, 34% obese, and 6% extremely obese. Dr. Campbell details the connection between nutrition and heart disease, diabetes, and cancer, and also its ability to reduce or reverse the risk or effects of these deadly illnesses. What does consuming BAC have to do with protein? BAC itself contains approximately 50% protein made up of the 20 amino acids found in the human body, including those 8 that are essential, the whole resulting in a 95% NPU (Net Protein Utilization). And BAC is much more than its protein content. Its principal value is that when you consume BAC on a daily basis, due to its nutritional impact on the hypothalamus, you benefit from better assimilation of all the nutrients in your foods. 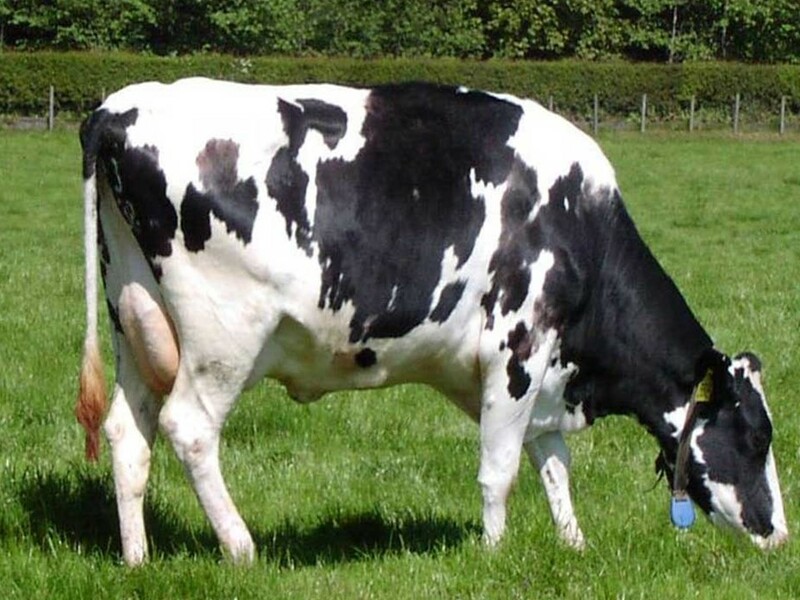 Adding one gram of BAC daily to the cow feed results in: 5000 grams less protein supplement needed daily 5000 more grams of milk daily, 9.3% more fat and 8.6% more protein in milk, efficient reduction of mastitis and osteoporosis, and increase of five more years of lactation. To consume a diet that contains enough greens, vegetables, legumes (peas, beans, and lentils), and fruits is sufficient. As long as you are eating a variety of plant foods in sufficient quantity to maintain one’s weight, the body gets plenty of protein. Hopefully with this information you can relax with full confidence that you will get your proteins daily whether you consume animal protein or not.